We will be looking at Rome, Ravenna and Dura Europos. 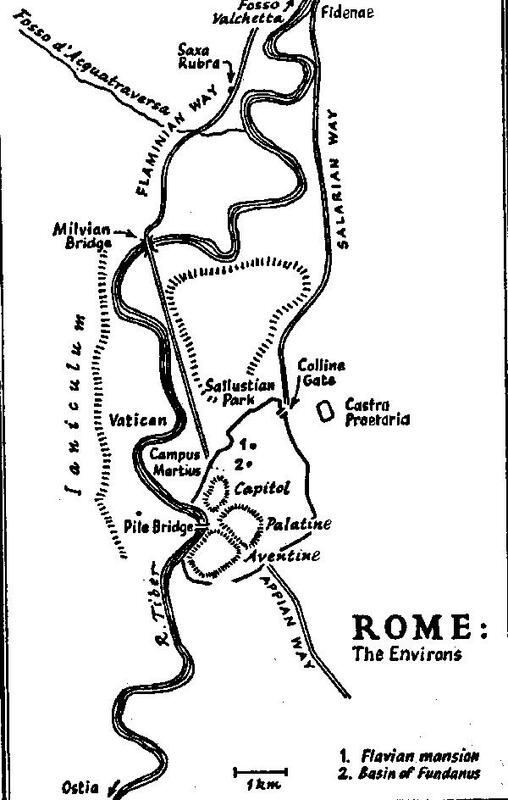 The centre of power moved to Ravenna and then to Constantinople. The tetrarchs ruled at the end of the Roman Empire. Constantine (in 330) killed off the other tetrarchs and moved power to Constantinople. Constantinople was the centre of the trade routes from the Far East, the Middle East and the Mediterranean. Christians were only persecuted under Nero and then Diocletian. Between these emperors Christianity was accepted. showing early Christian burial sites outside city including St. Peters burial site and S. Agnese. Cubiculum was used for elaborate burials. Early image of Christ in Commodilla catacomb late 4th C. Arcosolium Jonah sleeping under a gourd tree with the classical image of sleep (of a hand over th head with the elbow raised). Catacomb paintings are done with fleeting brushstrokes (we don’t know if they were painted on wet plaster or dry). There was a style at the time of fleeting brushstrokes so they may look hurried for stylistic reasons. The story of Jonah is 3m across and has lost a lot of paint but is still very elaborate. Hercules and Daniel in the lion’s den. Were painted by the same artist most probably. Christians adopted the Old Testament stories (the Second Coming and so on). [ text: Junius Bassus 359. The sarcophagus is huge 1m deep, In Vatican in pure white marble, taken from the catacombs. It is covered with pictures from both the old and the new testament including Job (with a women holding her nose because of the smell of the boils), Daniel in the lion ‘s den, the arrest of Peter, Paul and Christ, Adam and Eve, Christ and Pilate. Note that at the time some mass production] techniques were used, for example, blank sarcophagi with a blank head ready to be carved with the owner’s face. The look is very classical overall but some figures were recarved in the 19th C. This sarcophagus shows that carving skills had not been lost as some have claimed. [ text: Mausoleum of S. Costanza. Outside Rome. Has a narthex (entrance) with ambulatory outside — central circular area. Sarcophagus of Costanza made fm porphyry now in Vatican. Mosaics of scenes such as wine making. There were mosaics in dome but they were destroyed in the 17 as they were thought to be pagan but there were drawing made at the time and we now think they were Christian subjects. Cupids, erota (Greek for sexual love as so Cupid, Eros) making wine. Today has Bacchus / Dionysus associations but then also had Christian associations (Eucharist). Note, by the 5 and 6 it had become a Greek speaking world. St. Nilus of Sinai wrote in the fifth century that the icons were placed in churches so that the illiterate who are unable to read the Holy Scriptures, may, by gazing at the pictures, become mindful of the faith. Ref: Boris Uspensky, The Semiotics of the Russian Icon (Lisse: Peter De Ridder) 1976, p. 9. Pope Gregory the Great expressed the same idea: What a book is to those who can read, a picture is to the ignorant people who look at it. Because in a picture even the unlearned may see what example they should follow; Because in a picture they who know no letters may yet read.] Ref:Boris Uspensky, The Semiotics…. p.10. Ref: http://nesusvet.narod.ru/ico/books/mlvjvch/ Paulinus Bishop of Nola thought images could teach and could be used to reduce drunkenness and gluttony. Did images arise from such didactic and educational considerations imposed from above or from below, because people liked them? S. Maria Maggiore 432 AD constructed by one of the popes. Mosaics are from early 4-5th C from the New Testament. Even by the 5th C there was no clear single way of representing the people and activities in the bible. For example, the Annunciation shows Mary dressed as a Roman woman and there are many angels present. 431 Ephasus — debate about the importance of Mary and the start of the cult of Mary. The stories of Mary’s childhood are later (8-9th C immaculate conception). [ text:S. Vitale and Mausoleum of Galla Placida. Every by part of the inside is covered in mosaics. Ceiling has the symbols of the four evangelists. The first living creature was like a lion, the second was like an ox, the third had a face like a man, the fourth was like a flying eagle. Ref: Galla Placida was married to a Goth and was half sister of the Eastern emperor. ]Galla Placida (388 – 450) Empress. Daughter of Roman Emperor Theodosius the Great. She was the sister of the Eastern Emperor Arcadius and the Roman Emperor Homorius.” Ref: S. Vitale was begun before 540 AD but taken over by Justinian from Constantinople, Circular narthex lending in, exedras, ambulatory, used to be all covered in mosaic. Christ and Vitalis and angles in the apse. Holding a martyrs wreath. Three portrayals of Christ – young, bearded, and a shepherd. In Early Christian art Christ was not portrayed in a single way. A lot of early images of Christ had associations of Apollo (young and beautiful) and as a ruler with a baton. Winged angels associated with Nike Victory, i.e. borrowing from the iconography of ancient art. Image of sacrifice of Isaac from Old Testament also in S. Vitale. Panels next to altar on images of Justinian and Theodore. (He never actually went there). Often discussed in Byzantine art when people talk about style. 4-5th C is the end of Early Christian art and by the 6th C the art is Byzantine although some images are still described as Early Christian. Imperial influence. Holding the bread and the wine of the Eucharist. i.e. rulers are claiming to be holy people with the sanction of Christ. Women were not allowed close the altar but kept in gallery and the aisles. Hiratic, move from naturalism, floating (feet not firmly on the ground), flat bodies, but there is a sense of movement, lively and individual expression. See Projecta casket in British Museum. Marriage gift for projecta and Seconda. A woman going to the public baths. Birth of Venus on end of casket. Christian insurrection – so all these images could be mixed in the 4th C. Apotheosis, diptych Rome 400 AD British Museum. Seated consul on a large sheet of ivory. It would have been sent to friends to announce the appointment to the important role of consol. There is a nice example in the V&A. Apotheosis ivory, note statue of dead man in a chariot being taken through the city pulled by elephants. Barbarini ivory in Louvre made of five panels. Emperor on horse with Nike celebrating victory. Subjugated people are shown underneath. Note Gaia supporting horses hoove and another supporting stirrup. Pagan images but it is Christian. One 5th C manuscript. More 6th C manuscripts. Purple dye with gold Greek writing, large format, Christ healing the blind man — Sinope Gospels. Vienna Genesis. Rebecca by well. Pagan image, bare burst (not Christian) representing the well. Monestry of St. Catherine in Sinai has been in use continuously since 6th C. Built on the site of the burning bush. Most 6th C icons we have are from this monestry. Early icons were made in caustic (wax), late in tempera, so they have survived well. Shows Virgin holding the child, St. George on the right and St. Theodore and two angels painted using fleeting brushwork. It is 3D, instant, moment in time image of angels. Icons become important, early on it was debated whether Christ should be depicted. Some are thought to be made miraculously. i.e. veil holding image of Christ from when he was walking to the cross, image on cloth taken from down a well. Christ on the cross was not commonly depicted, the earliest in the BM is from 420.